Interstate 894 (I-894) is a 9.3-mile (15.0 km) auxiliary Interstate Highway in Milwaukee County in the US state of Wisconsin. The route serves as a bypass of downtown Milwaukee, connecting with I-94 at the Zoo Interchange west of downtown and the Mitchell Interchange south of downtown. The route is concurrent with three other highways for its duration, following US Highway 45 (US 45) from the Zoo Interchange to Hale Interchange as the Zoo Freeway, where it separates from US 45 to follow I-43 heading east to the Mitchell Interchange as the Airport Freeway. Interstate 41 runs concurrent for its entire length. It can be used to avoid downtown Milwaukee. The route is also called "the bypass" by local drivers. Usually the numerical designation is used alone for the entire route in local traffic reporting. I-894 in its entirety is concurrent with I-41, and the east–west portion is also concurrent with I-43. I-894 is part of what was proposed to be an extensive freeway network around the Milwaukee area. The Zoo Freeway portion was completed from Beloit Road northward in 1963, and the Airport Freeway and remaining segment of the Zoo Freeway were completed in 1966. I-43 was routed concurrently with I-894 in 1988. I-894 west at the Zoo Interchange. US 45 now carries the I-41 designation in the area. I-894 begins at the Zoo Interchange in Milwaukee with I-41, I-94, US 41, and US 45. The highway heads south as part of the Zoo Freeway from this interchange concurrent with US 45. Traffic reports generally refer to this section either as 894 Northbound (Southbound) or the Northbound (Southbound) Bypass. North of the Zoo Interchange, US 45 continues separately as the north part of the Zoo Freeway. I-894 enters West Allis before its first exit after the interchange; this first exit is a junction with Wisconsin Highway 59 (WI 59), known locally as Greenfield Avenue. After the first three exits, I-894 enters Greenfield. Further south, I-894 has interchanges with National Avenue, Oklahoma Avenue and Beloit Road. This section of the bypass is usually congested during rush hour because of traffic on I-894 and merging traffic from the Rock Freeway (I-43). This 4 mile stretch usually has travel times between 10–15 minutes during the rush hour (as opposed to 5 minutes during non-rush hour times). The Interstate turns eastward at the Hale Interchange in Hales Corners. US 45 turns westbound at that point to follow I-43/Rock Freeway South, and I-43 North follows I-894 to the east. The highway becomes the Airport Freeway and reenters Greenfield after the Hale Interchange. Generally, this section is referred to as I-894 eastbound (westbound), as I-43 was not added until the late 1980s. Westbound I-894 exits to WIS 24 (Forest Home Avenue) after the junction, though the eastbound highway only exits to a nearby local street. I-894 has two more exits after this and meets WIS 36 (Loomis Road) before reentering Milwaukee. It meets WIS 241 (South 27th Street) at exit 9 before terminating at the Mitchell Interchange with I-94, I-43 and US 41; I-43 continues northbound concurrent with I-94. I-894 passes generally through residential areas for its entire length with the exception of a few commercial districts right next to the freeway such as the Southridge Mall district. The highway serves as a bypass of downtown Milwaukee. With the approximate distance traveled through downtown via I-94 at 11.8 miles (19.0 km), I-894 provides a shorter distance for travelers heading to Chicago or the Mitchell International Airport. The Zoo Freeway portion as of 2007 carries at most 170,000 vehicles per day—with the highest values closer to the Zoo Interchange. The Airport Freeway carries up to 134,000 vehicles per day. I-894 is only a part of an important history of the Milwaukee area's freeway system. The freeways that exist today are only a part of what the Milwaukee County Expressway Commission had hoped would be built by 1972. The Zoo Freeway between Beloit Road and North Avenue was completed in 1963. At that time, the portion between Beloit Road and the Zoo Interchange was signed as I-894. The remainder of the Zoo freeway to the Hale Interchange was completed in 1966 when the Airport Freeway was constructed. US 45 was rerouted to the freeway, as was WIS 15 south of National Avenue. (The Rock Freeway had also been constructed west to 108th Street at the time.) The Airport Freeway was proposed to be routed to the also proposed Stadium Freeway South along Howard Avenue which is about 0.75 miles (1.21 km) north of the current alignment and named the Howard Avenue Expressway. The Airport Freeway construction was completed in 1966 to fully open I-894. Both freeways were slated to become part of the Interstate system in 1957, prior to their construction. I-43 was signed along the Airport Freeway concurrently with I-894 in 1988 after being officially designated in 1987. A remnant of the proposed Stadium Freeway remains connected to I-894 near WIS 36 as an unbuilt interchange. Its three completed ramps are closed to all traffic, and the ramps provide previously had allowed busses access to a park-and-ride The fourth ramp was demolished. The entire highway is in Milwaukee County. 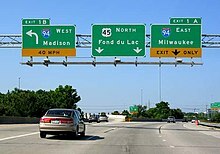 I-41 north / US 41 north / US 45 north – Fond du Lac Northern terminus and northern end of the I-41, US 41 and US 45 concurrency at the Zoo Interchange; the Zoo Freeway continues northward as I-41 and US 45; signed as exits 1A (I-94 east, Downtown Milwaukee) and 1B (I-94 west, Madison); I-94 exit 305. US 45 exits 38A-B. ^ a b Southwest Region Staff (December 31, 2008). State Trunk Highway Log for Southwest Region (XLS). Madison, WI: Wisconsin Department of Transportation. 894E. ^ Milwaukee Co (PDF) (Map). 1:100,000. County Maps. Cartography by U.S. Geological Survey and the Wisconsin Department of Transportation. Wisconsin Department of Transportation. January 2011. Archived from the original (PDF) on January 25, 2007. Retrieved July 19, 2011. ^ Google (January 15, 2009). "Overview Map of I-894" (Map). Google Maps. Google. Retrieved January 15, 2009. ^ Google (January 15, 2009). "Route through Milwaukee via I-94, Zoo Interchange to Mitchell Interchange" (Map). Google Maps. Google. Retrieved January 15, 2009. ^ Milwaukee County Freeway System 2007 Mainline AADT Only Annual Average Daily Traffic (PDF) (Map). Wisconsin Department of Transportation. 2007. Map 2 of 3. Archived from the original (PDF) on June 1, 2010. Retrieved March 7, 2008. ^ Milwaukee County Freeway System 2007 Mainline AADT Only Annual Average Daily Traffic (PDF) (Map). Wisconsin Department of Transportation. 2007. Map 3 of 3. Archived from the original (PDF) on June 1, 2010. Retrieved March 7, 2008. ^ Bechtel, George (1999). A History of Wisconsin Highway Development 1945–1985. Madison, WI: Wisconsin Department of Transportation. OCLC 20574213. ^ Google (January 15, 2009). "Greenfield Interchange" (Map). Google Maps. Google. Retrieved January 15, 2009. ^ King, Randy (August 16, 2010). "Exit Numbers on Interstate 894". Wisconsin Department of Transportation. Retrieved July 19, 2011. This page was last edited on 6 February 2019, at 23:55 (UTC).